These are all scanned, compressed, and cropped for display on a webpage. This page is Googlebot blocked. 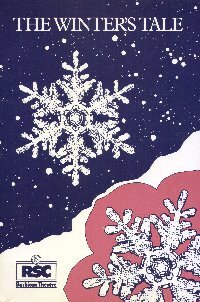 Ten Times Table by Alan Ayckbourn (13-14/11/84). 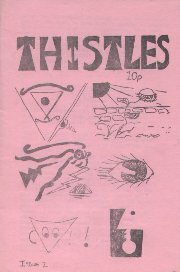 Directed by Chris Collard; Liz Loxton (Helen Dixon); Phil Frier (Max Brunt); Graham Harvey (Donald Evans); David Derbyshire (Lawrence Adamson); Erica Leaney (Sophie Barton); Paul Marsden (Eric Collins); Peter Fallon (Captain Tim Barton); Vic Saunders (Audrey Evans); John Evans (Ray Dixon); Amanda Smith (Philippa). 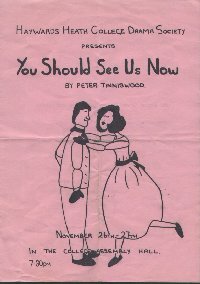 You Should See Us Now by Peter Tinniswood (26-27/11/84). 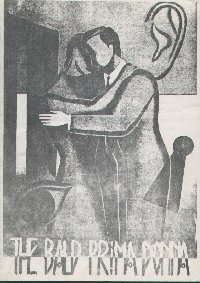 Directed by Caroline Snowling; Nick Wilson (Graham Carey); Michael Ward (Ernest Rowley); Kate Donnelly (Pamela Rowley); Wendy Turnwell (Sheila Chilton); Mandy Harris (Mrs. Mitten); Jo Haffenden (Kate Cockburn). 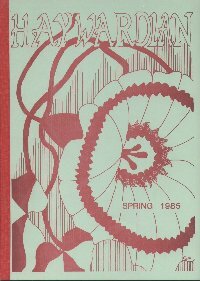 The Bald Prima Donna by Eugene Ionesco (18/3/85). 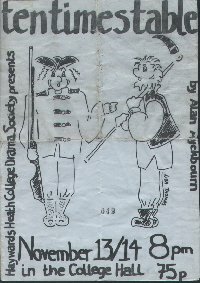 Directed by Rupert Nieboer; Neil Finney (Mr. Smith); Helena Meek (Mrs. Smith); John Evans (Mr. Martin); Emma Parkin (Mary); Graham Harvey (Firechief); The Licensed to Kill Students' Revue was directed by Caroline Snowling. 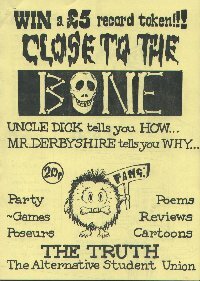 Writers: Marcus Knapp, Nick Carpenter, David Derbyshire, Debbie Sargent, Nick Wilson, and Caroline Snowling; Performers: David Micklem, Marcus Knapp, Nick Carpenter, Denise Waddingham, Martin Roue, Mark Bentley, Stephen Palles-Clark, Adam Hunt, Tim Way, Louise Bentley, Caroline Snowling, David and Neil, Jane Stone, David Derbyshire, Roisin Davison, Nick Wilson, Amanda Hinkley, Jason Upton, Stewart Avery, Adrian Stone. 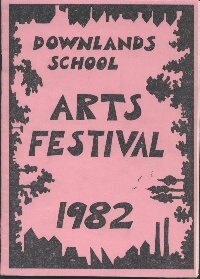 Festival Week (18-22/3/85): Monday kicked off with Disco Dickenson and the Pop Quiz heats, artroom concerts featuring Benny and the Gillstones and The Jazzband, Staff v. Students hockey on the front pitch, the Lunchtime Theatre offered bizarre and surreal improvisation in E11, and in the evening, The Bald Prima Donna and The Licensed to Kill Students' Revue (above). Tuesday was Dressing Up Day with the Mr. & Mrs. Festival Freak Contest, more artroom concerts featuring The Velvet Curtain Revolution and Baghdad Railway 41. The Politics Society hosted Peter Tatchell, the Lunchtime Theatre performed The Stronger by Strindberg, and the evening movie was Blazing Saddles. Wednesday saw the Mock Election Speeches, the Team Challenge Final, some Live College Television, and American Football on the back field. 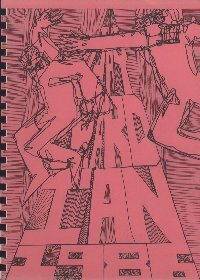 The Electric Evening kicked off at 7.30pm with Black October, Acacia Avenue, Moon Zero II, Stone Cold and Automatic Barrier. 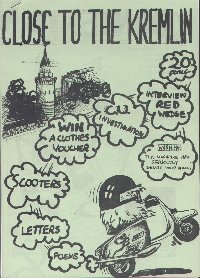 Thursday offered us the Pop Quiz Final, more artroom concerts with the Woodwind Group and Chris Collard, Student Rugby on the back pitch, the Politics Society hosted SDP parliamentary candidate for Guildford, Mrs. Margaret Sharp, and the Lunchtime Theatre performed The Last To Go by Harold Pinter. The evening slot was filled with You Know What?. Friday concluded the week with the Mock Election Results, artroom concerts with The Two Nicks and Automatic Barrier, the Festival Week Awards Ceremony (including the Staff Personality Awards), the Staff v. Students Badminton in the Games Hall, and the Politics Society hosted Tim Renton. 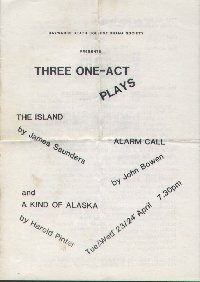 Three One-Act Plays (23-24/4/85): The Island by James Saunders: Juliet Burgon (Kay); Alison Gale (Sue); Anjali Dholakia (Jo); Stephanie Moses (Vi); Kirstie Milne (Dee); Stephen Sandilands (Pod); Martyn Pugh (Mat); Alarm Call by John Bowen: Emma Cleaveley (Sarah); James Hill (client); William Gilbert (interviewer); Toni Dann (Bridget); Sarah-Jane Viney (Schiz; Mrs. Henley); Tracey Griggs (Emily; sociologist); James Hill (Tommy); A Kind of Alaska by Harold Pinter: Doreen Turner (Deborah); Paul Marsden (Hornby); Vivien Saunders (Pauline). 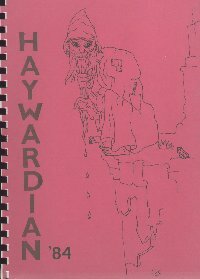 All the plays were directed by the casts with assistance from Val Parker and William Gilbert. 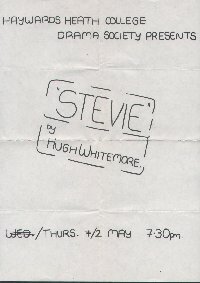 Stevie by Hugh Whitemore (1-2/5/85). Directed by Caroline Snowling; Kate Donnelly (Stevie Smith); Amanda Smith (Lion Aunt); Nick Carpenter (Man). 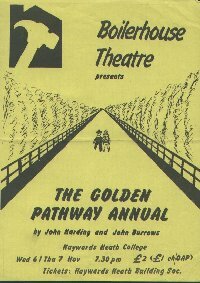 The Golden Pathway Annual by John Harding and John Burrows (6-7/11/85). Directed by William Gilbert; Sion Taylor (George Peters); Liz Loxton (Enid Peters); Ben McQuillan (Michael Peters); Andrew Powell and Vicki Thompson (sharing the 12 remaining roles). 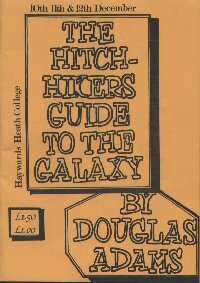 The Hitch-Hiker's Guide to the Galaxy adapted from the work of Douglas Adams (10-12/12/85). Produced and directed by Paul Marsden (technical production and direction by Oliver Sturrock); Nick Carpenter (Narrator; book); Adrian Stone (Zaphod Beeblebrox); David Derbyshire (Arthur Dent); Michael Fallon (Ford Prefect); Cordelia Molloy (Trillian); Douglas Johnson (Slartibartfast); Philip Nott (Marvin; Frankie mouse); Richard Kibble (Prostetnic Vogon Jeltz; Deep Thought); Nicky Hicks (Barmaid; Eddie Two; Benjy mouse; Loon); Debbie Elliot (Shooty; Fook); Charlotte Pughe-Morgan (Lunkwill; Bang-Bang); Wilson Forsythe (Prosser; Eddie One; The whale); Roland Philips (Vogon guard; Phougg). 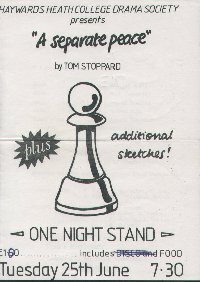 A Separate Peace by Tom Stoppard; One Night Stand (25/6/86). Co-directed by the cast: Stewart Avery (Brown); Nick Carpenter (Doctor); Amanda Hinkley (Maggie); Helena Meek (Matron); Anjali Dholaki (Nurse Jones); Nick Wilson (Director). 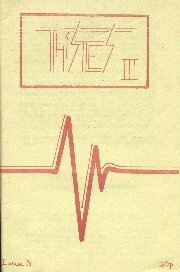 With sketches written and produced by David Derbyshire; 'Music' from Peter Fallon, Michael Fallon, N. Roe, Steve Lacey, Phil Wooller, John Palmer; Macbeth Produced by Val Parker, cast: Stewart Avery, Michael Fallon, Paul Marsden, Val Parker, H. Chignell; with refreshments provided by the Social Committee. 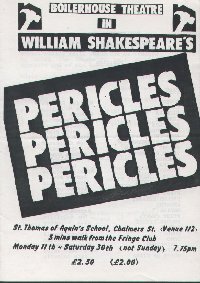 Pericles by William Shakespeare (16/9/86-Edinburgh Festival). 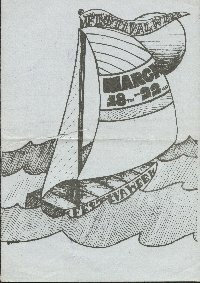 Directed by William Gilbert; William Gilbert (Gower); Ben McQuillin (Cleon; second sailor; first pirate); Rebecca Skelton (Dionyza; bawd); Nick Carpenter (servant; first fisherman; Cerimon; second pirate; Lysimachus); Stewart Avery (Pericles); Keith Sharp (Antiochus; Simonides; Pandar); Anjali Dholakia (Antiochus' daughter; Lychorida); David Derbyshire (second fisherman; first servant; Helicanus); Andrew Powell (third fisherman; first sailor; Leonine; Boult); Liz Loxton (Thaisa); Amanda Hinkley (second servant; Marina); Kate Donnelly (voice of Diana). Back to the Blurb page.